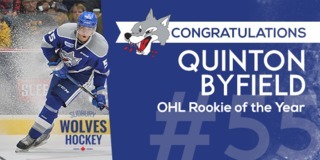 The Sudbury Wolves got the revenge they were looking Wednesday night when they shut-out their Highway 17 rivals, the North Bay Battalion. 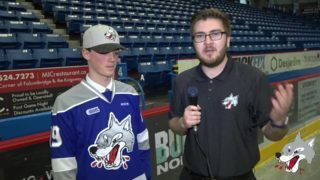 It was a big night for Blake Murray who scored two goals that helped the Wolves top the Battalion 5-0 with final shots on goal 49-23 in favour of Sudbury. Other Wolves’ goal scorers included Blake McConville, David Levin and Anthony DeMeo. The Wolves also secured all three stars of the game. Blake Murray earned first star while Ukko-Pekka Luukkonen and Macauley Carson earned second and third stars. Blake McConville gave the Wolves an early jump on the Troops just over 2 minutes into the opening frame to score his second goal of the season. Following his goal, Blake Murray tallied another for the good guys to take a 2-0 lead. The Wolves continued to outplay the Battalion by adding another two goals to the scoreboard. 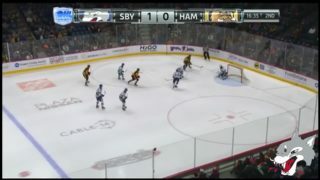 David Levin recorded his 18th goal of the season in his 200th OHL game where Peter Stratis and Luukkonen earned assists. At 16:32, Christian Purboo relieved Christian Propp from the crease, but that could not stop Blake Murray who buried his second of the game forcing the Troops to trail 4-0 after 20 minutes. Moving into the second period, the Wolves had no intentions of backing down. 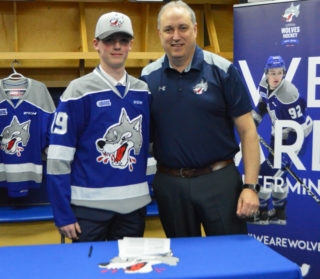 Just under 2 minutes in, Anthony DeMeo extended the Wolves lead to 5 with his first goal as a Wolf, scoring from the high slot to beat Purboo. 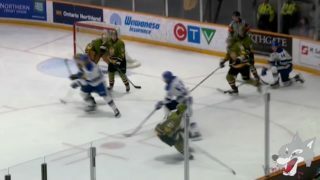 The Battalion showed their frustration in not being able to beat Luukkonen as the battle became more physical after Macauley Carson and Daniel Walker dropped the gloves. The Wolves continued their hard play in the final frame playing a solid 2-way game. No goals from either team in the third period caused more tension between the two squads. Another pushing match broke out but between Ryan O’Bonsawin and Daniel Walker, however, in the last efforts for North Bay to make a comeback it was the Wolves who prevailed. The Wolves will look to keep things rolling and extend their 4-game winning streak on Friday night as they host the London Knights for the only time this season at 7:05pm. 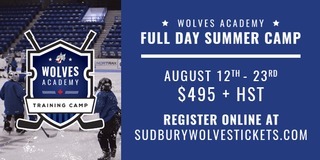 Tickets are on sale at the Sudbury Arena Box Office or at greatersudbury.ca/tickets.